Almost a year after the L.A. City Council approved a moratorium on new off-site and supergraphic signs, and four months after it replaced that temporary measure with a permanent ban, advertisers and sign companies continue to wrap, hang, and otherwise display their multi-story supergraphic signs on the walls of buildings throughout the city. 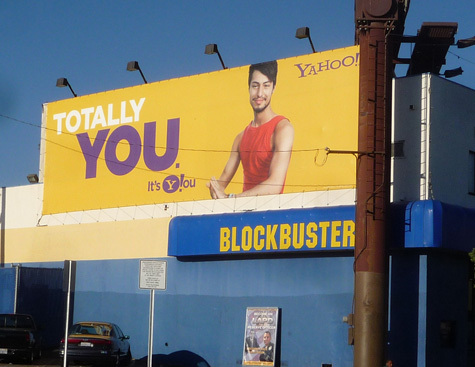 One building on Melrose Ave. has seen three illegal signs go up in the past year, advertising such major entities as Chase Bank, the Melrose Place tv show, and HTC cellphones. 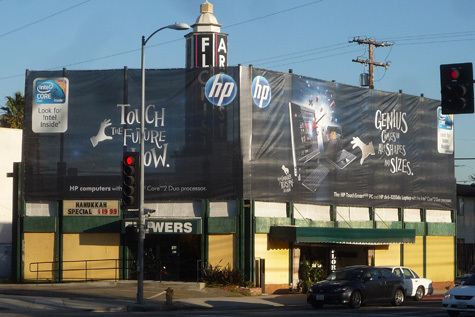 On Pico Blvd., a Hewlett-Packard sign is wrapped around two sides of a flower shop, even covering the shop’s own sign, which is surely a statement about the lure of the revenue to be had from illegal off-site advertising. 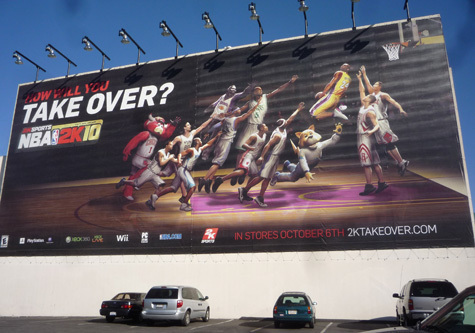 Other buildings sport ads for movies, clothing, banks, electronics and other corporate products and services. 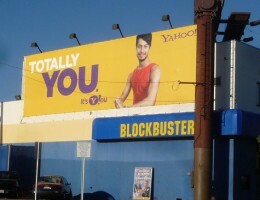 Ad on video store on Santa Monica Blvd. For several years, the modus operandi of the companies was to put up the signs, then file lawsuits in federal court when they were cited by the city. That led to a judge’s ruling in 2008 invalidating the city’s 2002 ban on off-site signs because it allowed exceptions deemed unconstitutional. But the moratorium that went into effect on Dec. 26, 2008, and the permanent ban passed by the city council on Aug. 7, 2009, removed those exceptions, and the same judge has declared in more than one ruling that those ordinances now pass constitutional muster. So why are property owners and sign companies willing to risk open violation of the law, and advertising agencies and major corporations willing to look the other way? The answer is easy to surmise from the fact that a large supergraphic in a high-traffic location can generate upwards of $50,000 in monthly revenue, while the maximum fine for violating sign law provisions is $100 a day. The City Attorney’s office has filed at least two civil suits under a public nuisance provision that allows fines of up to $2,500 a day, but those lawsuits are slowly moving through the courts and any resolution is likely to be months away, if not longer, depending upon appeals. In the meantime, absent any sudden displays of social and civic responsibility on the part of the outdoor advertising industry, expect to see the city’s public spaces occupied by more and more of these huge sales pitches demanding the attention of everyone driving, walking, bicycling or otherwise moving past them.